Grandmaster Chan Man Cheung (陳萬祥) was born November 5, 1929 in Guangdong, China. He began kung fu training with his father when he was just four years old. At age 11, he joined a Jow Ga school located near his home. 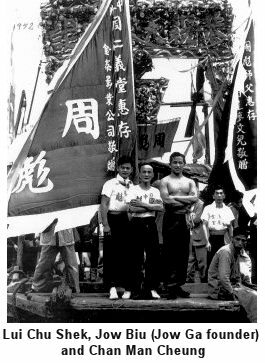 The school belonged to Jow Biu (周彪), one of the founders and “Five Tigers.” It was the first Jow Ga school reestablished after the Japanese invaded China. He trained for three hours a day, everyday, to perfect his martial skills. When Jow Biu later moved to Hong Kong to open a school, Chan Man Cheung, at age 20, became his assistant instructor there. He conducted classes in the evenings while earning a living by day in the seafood industry. One of his managers asked him to teach his god-daughter. Because she wanted to be in the movies, Chan Man Cheung used his martial arts connections with movie stuntmen to help her. 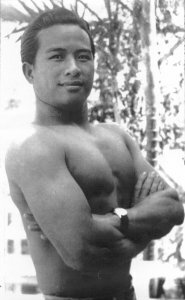 Due to his great skill in kung fu, he eventually became a martial arts coordinator for the movie industry and landed parts in several films. 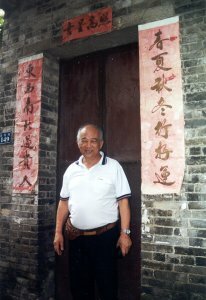 Grandmaster in front of his house in Dong Fong Village, Canton, China where he lived before moving to Hong Kong in the 1940’s Among his many accomplishments, he served as Chief Instructor of the Jow Biu Association in Hong Kong for four years, and was its Vice-Chairman. He has traveled widely to promote Jow Ga including participating in a Kung Fu masters tour of the U.S. In addition to several return visits to various martial arts schools in the U.S., he has been invited to Singapore repeatedly, as well as to Germany, to perform and give seminars. Even at age 70, his movements were still quick and agile. He was generous in sharing his knowledge, and was well liked due to his affable personality. He treated juniors and seniors alike, regardless of their status, with equal courtesy and respect. He truly led by example. 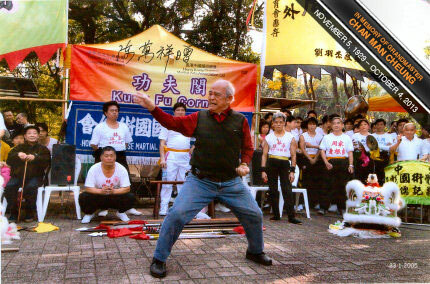 Grandmaster Chan Man Cheung passed away peacefully around 11am, Friday, Oct 4th, 2013, Hong Kong time (11pm, Thursday, Oct 3rd, US Eastern time). A well respected martial artist with prominent students across the globe and particularly the USA. He was 84 years old.